So if you know me AT ALL, you know I moved into our house with umpteen different ideas about how to change it, better it, PERFECT it. 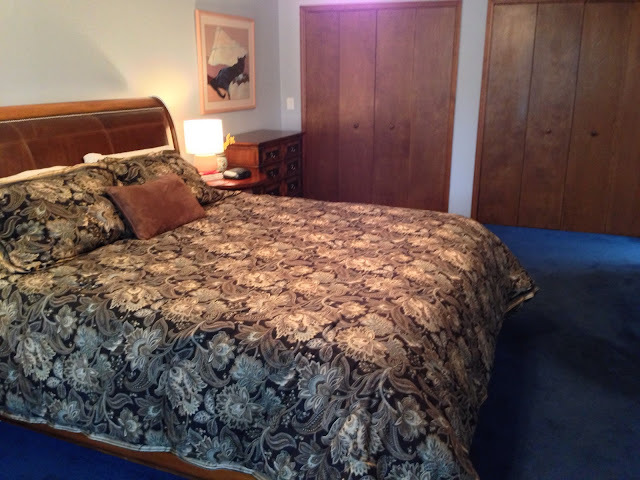 At perhaps the tip top of my list even before we moved in and had to live with it was replacing the horrible blue carpet in the master bedroom. It's nice carpet and all, but it's blue. So very blue. It's dark and it's thick and I just feel like I'm wading through mud when I walk around in there. Not only is it DARK (have I mentioned that? ), it's soft and squish and I just feel like I'm sinking. 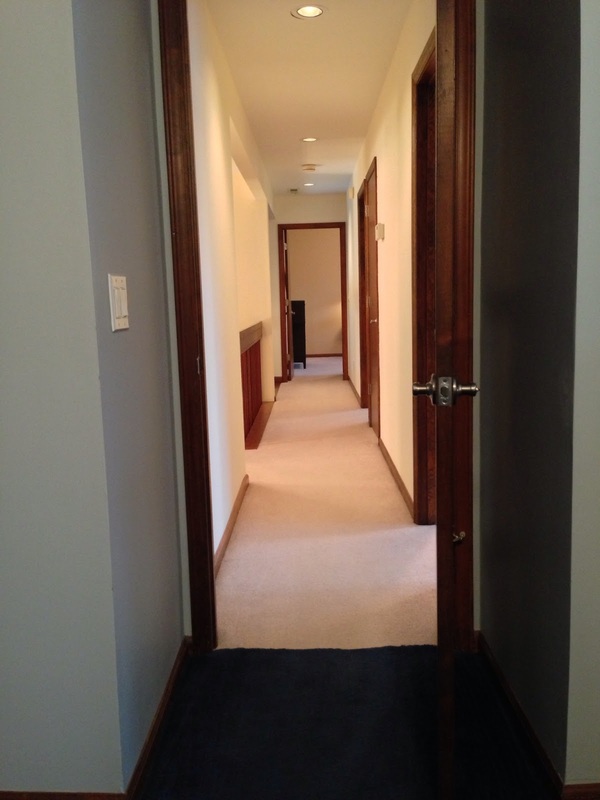 We've only got 8 foot ceilings, too, so that makes the whole room feel very .... squat. 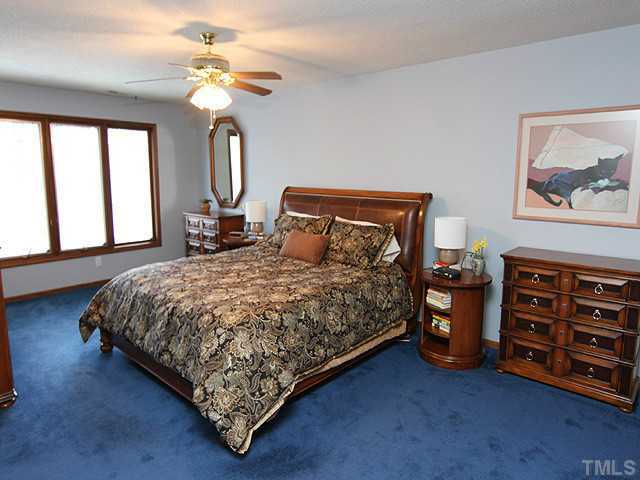 This photo was from the listing and does the room WAY too much justice. It's not that bright and the carpet is much much darker than this photo would lead you to believe. These photos were taken by me and they are more true to life. Yes, the second one is quite dark, but honestly, not too far off from reality. So, now that you're feeling good and sorry for us, let me brighten your day with pics of the floors I want to install in our entire house (well, just the upstairs first because we are not made of money). HOW GORGEOUS ARE THESE FLOORS? I'm in love. I found the floor inspiration by browsing Pinterest and came across the first picture. I loved the floors so much I contacted Melissa over at The Inspired Room and she pointed me to her blog post that gave the full details on where and what kind/brand of floors she had in her home. As you know, we have a 1986 contemporary and it's pre-open floor plans so we don't have wide open airy spaces. I want to put hardwood because I really dislike carpet. I want to have surfaces that are easy to clean and dust. I think these floors are so beautiful. They are light and bright without being boring and they are a lovely contemporary look. We also plan on slowly replacing the boring hollow-core doors that remain in the house with single panel doors that are WHITE. I'm already busy painting some of our trim here and there with a nice, fresh coat of glossy white. We won't paint any baseboards, but will instead replace them with larger, white ones in order to kill two birds with one stone. I hate whimpy baseboards.